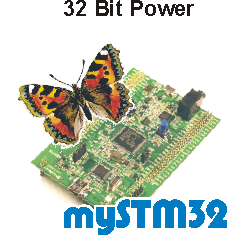 These SiSy projects include a number of examples of the application of your myAVR Board respectively for the myAVR Board into assemblers and working examples. You find examples of digital I/O, Comparator, frequencies, timer, Watchdog, A/D transducer, interrupt, UART etc., in C.
You need SiSy AVR for looking or working in these projects. The examples work with the myAVR Board MK1 and the myAVR Board MK2. The description of the project is only in German available. This project contains 8 sample programs. The examples illustrate the structure of program flowcharts which were drawn with SiSy. The source code is generated into assemblers from the PAP. The programme caused from the source code can be immediately been aching for the controller. You need SiSy AVR for looking or working with this project. The comments of the programs is only in German available. Demo version the "myAVR Workpad SE", the integrated development enviroment of myAVR. This version is tuned especially for assembler developer and on the myAVR product range. The development enviroment is complete in German. For all Workpad users we provide a free update for the licence. The quick guide describes how you can program, compile, burn and test a microcontroller application in a few steps.This quick guidance is based on the software myAVR Workpad. 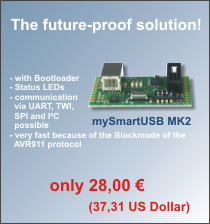 The description refers to the myAVR Board MK1 LPT and the myAVR Board MK2 USB. The programming language is assembler. If you want to use C or C++ then you have to use the myAVR Workpad PLUS. The development enviroment myAVR Workpad is complete in German with integrated help. Here you find the help to myAVR Workpad in English. This document is remembered as entering/the introduction to the programming of AVR microcontrollers with BASCOM attitudes of BASCOM as well as a first imperative and contains basic. Knowledge of a programming language like BASIC, C/C++ or Pascal is required. This short introduction is a statement from the myAVR textbook microcontroller programming. This textbook is contained in the myAVR beginner set, it is offered also separately in the shop. From the myAVR textbook this document contains select chapters a reading from the myAVR textbook microcontroller programming, among this the programming and the bases of microcontrollers (e.g. assembler) as well as an introduction to the AVR programming with C/C++ and BASCOM. The textbook is completely available in German and in our shop.